Enjoyed our time in Shrewsbury, as usual, but foul weather meant the 3rd Big Art Show was not a successful one for many of the exhibitors. Such a shame for them as the quality of work was very high, as usual, and there were a number of demonstrations. We had to empty and lower our gazebo each evening (in the rain!) as the winds were so strong and gusty that one marquee was overturned and destroyed. Next year the Shrewsbury site will be in the Quarry Park which is central to the town, prettier and more sheltered! However, the next Big Arts Show will be this year: from 9th to 11th September at Milford near Godalming in Surrey, so we’re keeping fingers and toes crossed for the weather there! The site will be at Secretts: an award winning foodie venue with farm shop, lake, PYO farm, cafe and artisan shops. 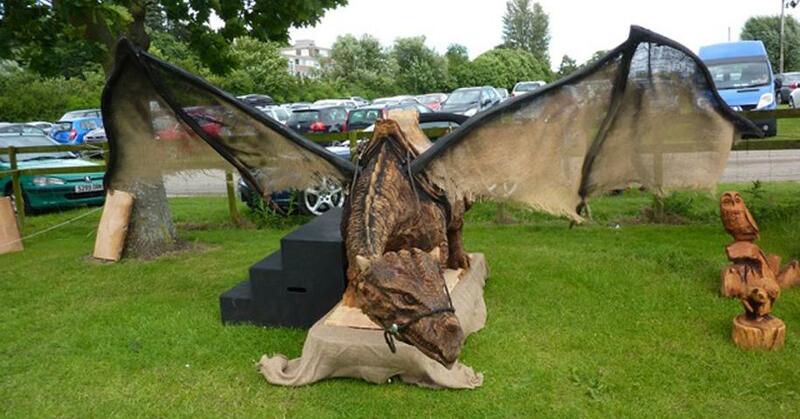 Below is an image of an amazing chainsaw sculpted dragon with a saddle that children could sit on and move his head. The articulated neck was controlled by a steel cord through the various parts so the head could be moved from side to side by pulling the reins. It also swayed in the wind as if looking for something or someone …!